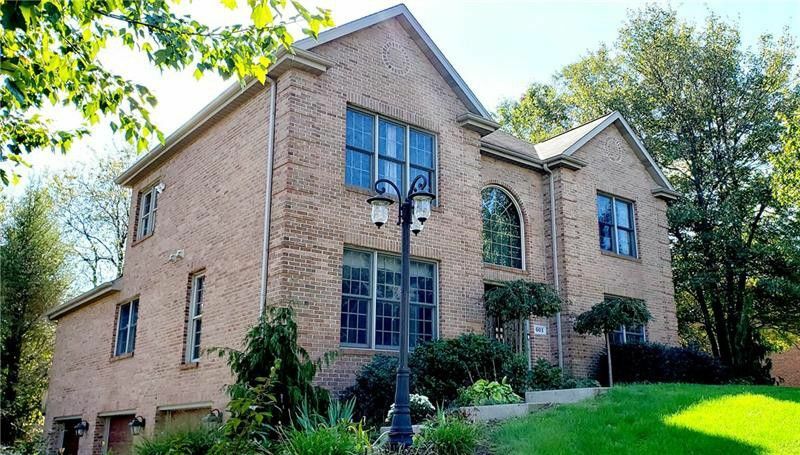 Nearly all brick custom built stunner with 1st floor master suite! Enter through new etched glass double front door into the two story foyer & be impressed by the new wood look ceramic floor found throughout much of the first floor. Formal living room boast crown. Formal dining room features crown molding, chair rail & impressive new fixture. Fabulous two story great room has two story fireplace & a wall of windows. Display your finest artwork in the impressive cut out in the great room. Find a recently updated powder room with trendy vessel sink & furniture style vanity. Updated kitchen boasts new stainless appliances including convection oven, tile back splash, quartz tops & breakfast bar. Breakfast nook opens to newly enlarged deck that overlooks new lower level deck, new retaining wall, private backyard & fire pit. First floor master suite offers double tray ceiling, new oiled bronze ceiling fan, new double basin granite top vanity, ceramic surround whirlpool, private commode, updated shower, walk in closet & new slider to deck & hot tub area. Upstairs find three spacious bedrooms with new carpet & a well-appointed double basin bath. Lower level has a game room, office with new carpet plus a full bath. Oversize three car garage is heated, cooled & has new garage doors & new floor covering. Home also includes new H2O tank, new security system, plus 1 year home warranty.